Everyone working in any form of project leadership role will receive dozens through to hundreds of emails daily. Some of these will be relatively anonymous distributions of project statistics, broadcast to large sections of the project team, but many will be direct person-to-person notes covering anything from simple status updates to very specific requests or responses. Of all of the notes you receive, how many of the personal pieces of correspondence do you actually acknowledge or respond to? and have you ever considered how powerful a team building and rewarding opportunity even the simplest response may be? Responses can be a simple as hitting the “reply” button, typing “Thank you” in the body of the message then hitting send, through to a longer note indicating why you appreciate the information or contact with specifics if appropriate. To you, this action may be a 10 second excursion from your day to day tasks that has no real significance to your day, but to the person who sent you the original note and receives the subsequent thank you or similar expression of gratitude, this 10 seconds may mean the difference between their positive engagement in the delivery of the project, their ongoing commitment to your team and even their retention within the project organisation or their feeling taken for granted and being disengaged from the task at hand, after all, who wants to work in an organisation or for a boss that doesn’t care about them. 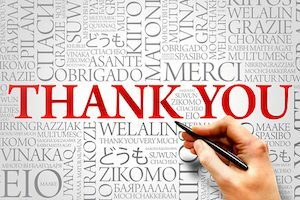 I am not suggesting that you spend your entire day responding on these tasks, but I am recommending that, as a matter of course, you aim to respond to any direct correspondence from any member of your project team with some form of gratitude and recognition. Perhaps, even, on occasion, doing a “reply all” when you are only one of the recipients, particularly if you are one of the more senior. This opportunity publicly recognises to the contribution of the sender and may also encourage some of your colleagues to start the practice. Every manager these days has a smart phone or similar device, so you could easily fit a thank you routine into your day, spending 10 free minutes during a commute or waiting in line for coffee to be grateful to your staff rather than checking Facebook or LinkedIn. If you consider how much time an effective project manager will spend on communications and team development, taking 2 minutes from your day to respond to several of these direct pieces of correspondence is an incredibly efficient and effective way to develop your team spirit. Have you any thoughts on this post or any similar experiences you would like to share? If so, we would love to hear from you.